If your’e struggling to understand SEO then this post is for you. 24 hours a day, 365 days a year the mighty Google machine is processing search engine requests. Some of these searches might throw up your content as being relevant to the search. Sometimes you might appear in the search but be so far down the rankings that no one ever gets to see your stuff or hear about your business. Which will be a shame. So imagine if armed with a little bit of knowledge, you could improve your search engine results and get more traffic. Traffic searching for your products or services, traffic eager to buy your stuff. If you could send more relevant traffic to your site do you think you could sell more stuff? Search is a free source of traffic to your business. With a little bit of knowledge you can improve your results, even if you employ web designers on your behalf, this is stuff you, the business owner needs to understand. I first came across Corey Perlman in an interview he did with Chris Ducker from Virtual Business Lifestyle. Until I heard the interview I had parked search engine optimisation in the ‘too difficult to understand’ box because the rules were constantly changing. What became clear to me, is that you don’t need to understand everything about SEO as a business owner. But you do need to understand some basics so you can at least ask the right questions to the right people. Following the interview with Chris, I went out and bought eBoot Camp: Proven Internet Marketing Techniques to Grow Your Business from Amazon. It’s not a long book, or a hard read for that matter. It basically assumes you have little or no knowledge of SEO and was written for small/medium sized businesses looking to extend thier presence on the web. The basic structure is that a technique is explained, what it does and why it’s important. Some case studies or examples. Then a ‘homework’ task for you to do yourself. 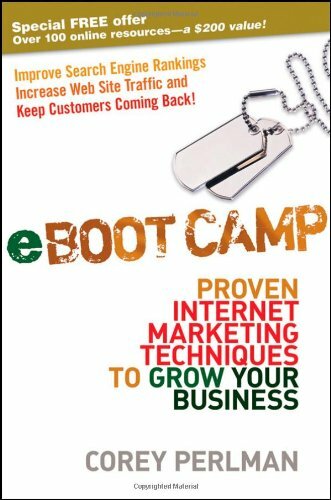 eBoot Camp covers everything from explaining how search engines work, pay per click advertising, how to use titles and meta tags, to how to use social networking and email. Although the book has been around since 2009 it’s not out of date. It covers the things that you need to know in a very strightforward way without baffling you with technical terms or overly wordy text. It has good illustrations so you can see exactly what the text refers to and how and where to apply the advice shared. Keywords are one of the things that really challenge me, because these are the keys to getting quality targeted traffic from the search engines. Get them right and you’ll get a lot of traffic, get them wrong and you’ll be living a lonely existence. So this is why you need to spend time choosing your keywords, even if you don’t know anything about coding or webdesign. If you engage designers, this is the one area where you can add value to your business. Corey explains that keywords are the search terms that people type into the search engine to search for a problem you want to be found for. For example if you were an emergncy plumber, then you might want the keywords, “emergency plumber”, or “water leaks”. The more important the keyword, the higher up your keyword list you should have it. If you operate from a location you might want to be more narrowly focussed with your keywords and include the location – for example “emergency plumber London”. He suggests brasinstorming search terms for your website and then testing these search terms out and seeing what other business names come up at the searches so you know who your competition is for those keywords. Whilst he doesn’t suggest you copy your competititons keywords, if you want to appear in the same searches, then you might want to consider having a similar list. Whilst there’s no hard and fast rule as to how many keywords you should have in your keyword list, Corey suggests 15-25, which can be keywords or key phrases (like in our plumbing example”. Step 1 Start thinking about the your business, the services it offers or products you provide and how these help people. Step 4 Now close your eyes and put yourself in the shoes of a potential customer who has no idea about who you are or what you do. All that this person know is that he or she needs a service or product that your website provides. Remember you are now in the mind of a potential customers. Write down the first 10 phrases that come to mind. Step 5 Take the three lists and prioritise them into one list of 20 words or phrases. Remember to localise your list by including cities and countries you do business in. This structured approach should be invaluable for selecting an approporiate keyword list for your business. Following on from keywords Corey talks about the importance of title tags and meta description tags and the importance of those in your rankings. A title tag is what appears in your search engine results, so you have to make it stand out from the rest of the competition on that page and be sufficiently interesting enough for people to click it. Key tips on choosing title tags: 5 – 10 words and make sure it’s interesting enough for someone to want to click through. So, if your tittle tag tells the user and Google what your site is about, a metatag is it’s sub heading. It’s more descriptive and longer than the title tag. Although the meta tag gives you more opportunity to be descriptive about your site, you should keep it to under 20 words as after that the text will be cut off. Is this book for everyone? No it’s not. If you’re keyword and meta tag savy then you might learn a few things, but the people that this book is useful for is any business owner who wants to attract more search traffic to his or her business but doesn’t know how to do it. The big temptation is that because you hired a webdesigner, they’ll figure out what needs to be done. Wrong. Chances are you’ll find that they’ve just left on the default settings and you’re missing a trick.